We’ve been eating a ton of these asian quick pickled carrots lately. 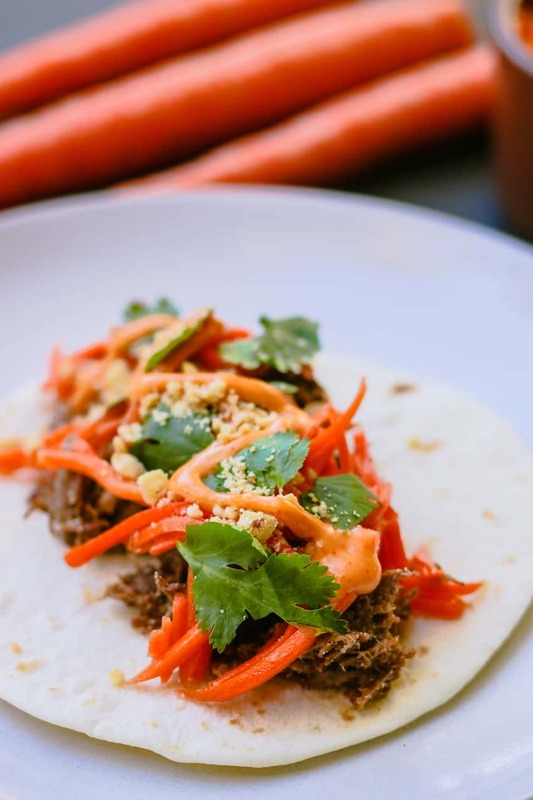 I made them on a whim when I had an overabundance of carrots, and we started throwing them in quinoa bowls, on top of pork meatballs, in rice-paper wraps, and lately on Korean-style beef tacos. A recipe for tangy quick pickled carrots with asian flavor. 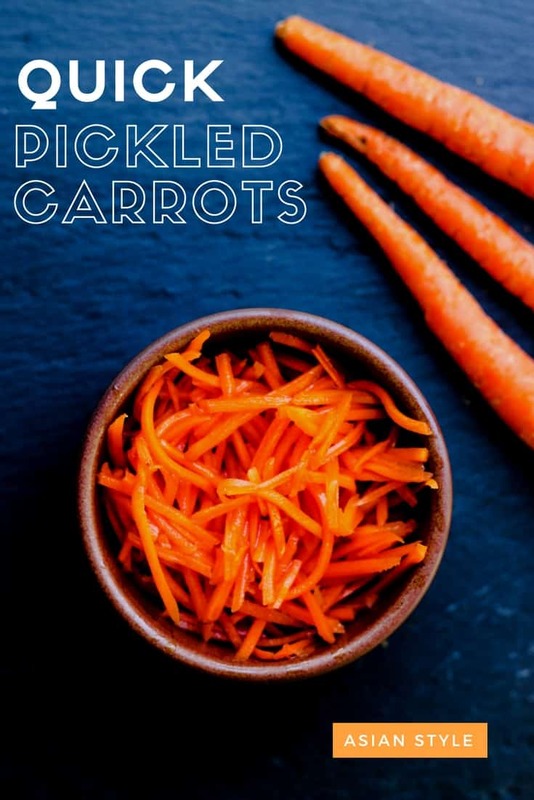 Use these pickled carrots as a topping on quinoa bowls, rice paper wraps, korean tacos, or mix with herbs and nuts for a stand out side dish. Place carrots in a small bowl or large mason jar. Pour over carrots. Mix to coat. Soak for at least an hour, up to a week. They get more delicious the longer they sit. Store in refrigerator. I’ve made this with thinly chopped carrots, ribboned carrots, and grated carrots. All were great. I made this recipe with carrot chips – not as great. Up to you! 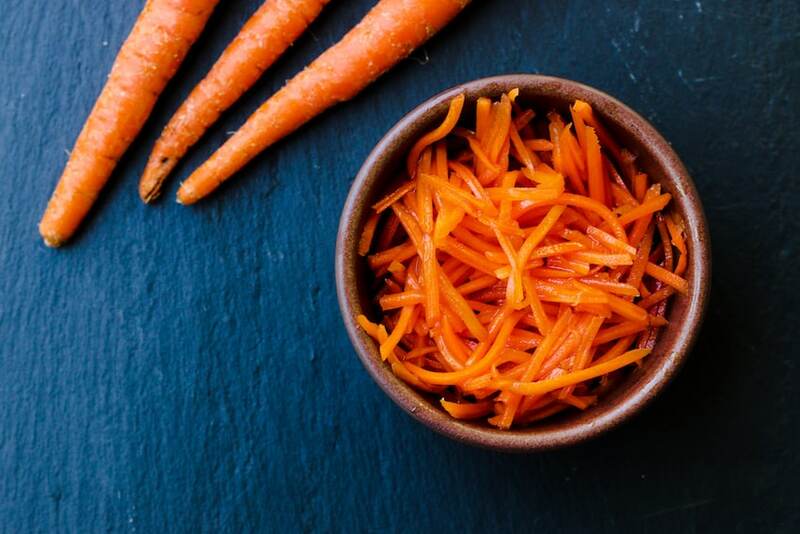 These carrots would be a great side dish for our Instant Pot Korean Ribs. If you’re into pickling, try some of our other pickle recipes, like Refrigerator Pickled Cranberries, Pickled Tomatoes, or Classic Spicy Dill Pickles. Thank you for reminding me how much I love Asian dressing. YUM!!! Do you also have a recipe for the Korean Beef “bed’ the carrot salad is nestled upon? Quick pickled carrots are such an easy way to get some pickled veggies as a side dish for an entree! Thanks a ton for sharing your recipe, I can’t wait to try this at home! It’s look like Indian veg pickle and Delicious too……. I can’t see the ingredients list because there is a video on top of it. I would really love to make these carrots to go over bibimbap, but there doesn’t seem to be anyway to get rid of the video. Every area I touch on that video just takes me to a larger screen of the video. I have re-entered this site probably 10 times and it is always there. Hi Jamie. Thanks for this recipe. I have been searching for one since our local Vietnamese market stall sells a lovely salad with pickled carrots. Can you tell me whether the carrots soften in the pickle mixture after time or do I need to par-boil?